Taking train from KL to Bukit Mertajam is probably the most preferred way to reach Bukit Mertajam. This is because there are not many bus services from KL to Bukit Mertajam. On top of being convenient, you can also save time by taking the train especially during public holidays. Bukit Mertajam is one of the towns in Seberang Perai, Pulau Pinang located nearby Butterworth. The town is not famous for tourism. 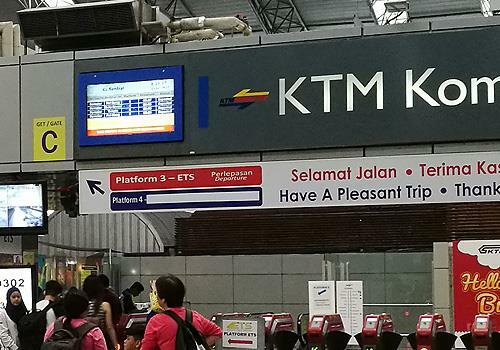 However, the train service is very popular among local commuters who work outside of Bukit Mertajam to go back and forth from their workplace to their hometown. Moreover, Bukit Mertajam is only one of the stop for ETS train from KL to Butterworth, which is a famous and on demand train service. Hence, the train tickets are sold out pretty quickly on public holidays. Click to see ETS train schedule, valid from 1st August 2017. Check for Bukit Mertajam stop in the schedule. KL Sentral is one of the best transportation hubs in Kuala Lumpur besides Terminal Bersepadu Selatan (TBS). You can get to KL Sentral with KTM train, LRT, KLIA Transit, KLIA Express, express bus, local city bus, taxi and more. It is normally crowded on weekend and even more during public holidays. To get to the boarding platform, go to the second floor and look for ETS train service. The location of ETS train service in KL Sentral is the opposite direction of KFC, nearby the bookstore. There are seating areas in front of the gate for you to sit while waiting for the gate to open. However, the departure platform is subject to change at the discretion of KTMB. You are advised to arrive 30 minutes before departure time and check your platform at KTMB counters. Bukit Mertajam train station is located in the town. However, not many public transportation is available once you reach the station since the train station is mainly served for the locals. If you are a local, you should have your family or friends to pick you up. If you are a traveller, it is best to plan for your transportation or try your luck on catching Rapid Penang city bus. If you easily get cold, make sure you have a sweater to keep you warm during the journey as the air conditioner might get you cold after a while. Also, book your train tickets in advance if you are planning to travel on this route during public holidays. Ease the process by booking online at BusOnlineTicket.com. Easily Book Your ETS Online Ticket from KL to Bukit Mertajam Now!